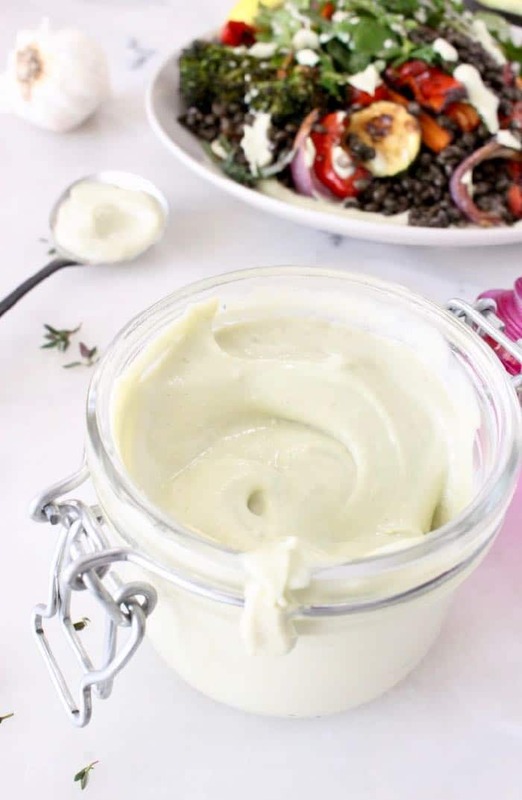 The creamiest garlic vegan aioli made with luscious avocados, a touch of dijon mustard and perfectly thickened with cashews. 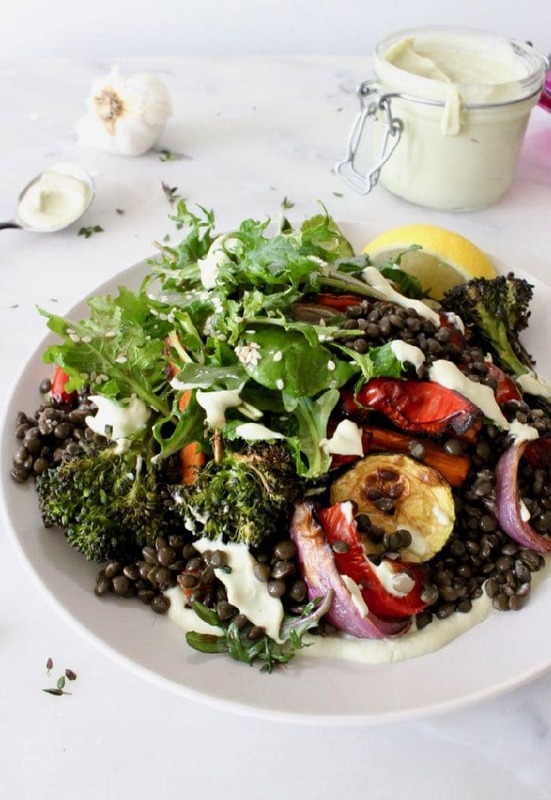 Doubles down as a dip, sandwich/ burger spread, drizzled over your favorite tacos or to dress this simple beluga lentil salad. You really can’t get this aioli out of a jar friends. This is one of those recipes that must be homemade and the good news is that the only piece of equipment you need is a blender. Throw everything in it and whip it good until fluffy and divine. What is Aioli Anyway ? 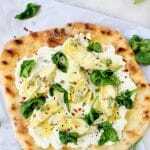 A rich Italian garlicky sauce, an emulsion traditionally made with olive oil and lemon, a mayo of sorts heavily flavored with garlic. But there’s really no need for added oils and fattening mayo, instead I adapted it to a whole foods plant-based version featuring the amazing avocado, not only delicious but also good for you! 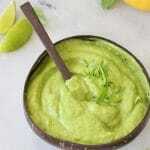 Better yet, why not make a few variations of vegan aioli sauces to have in the fridge for the week ? Store it tightly covered in glass jars /containers for up to 5 days. 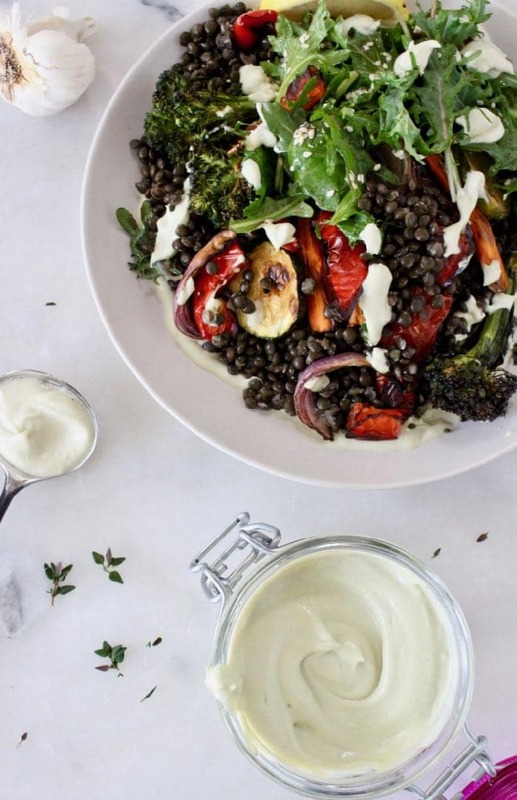 Pictured here is a simple beluga lentil salad with roasted veggies piled up high on plates slathered with aioli. My new obsession and favorite way to load up on lentils and vegetables on the daily. 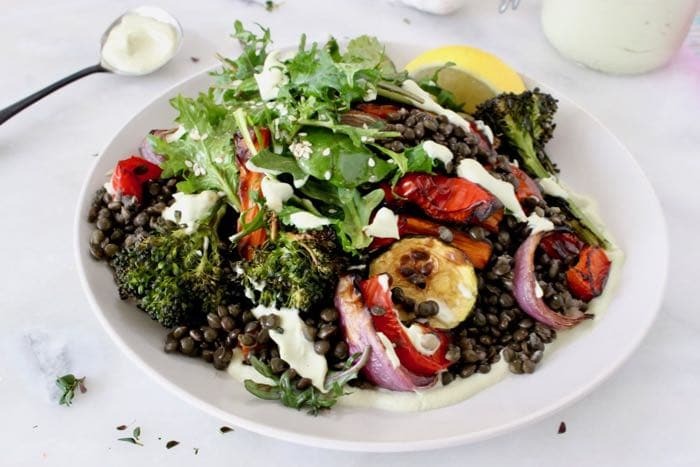 Just make sure to use either French Puy Lentils or the Beluga, those are the two varieties that keep their shape and texture perfectly al dente and ideal for salads. 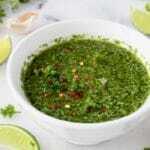 They can also be prepared ahead, simply infused with bay leaves and used in different dishes through the week. 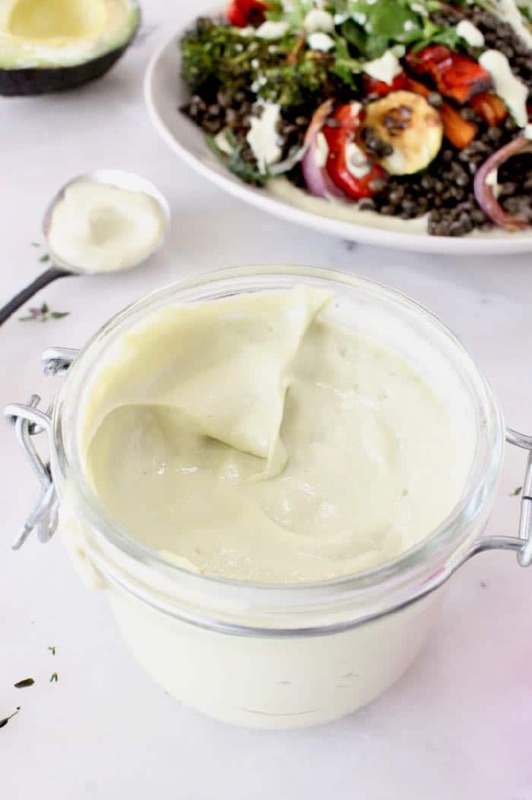 From earthy lentil salads to veggie burgers and fries, this vegan aioli sauce is sure to compliment many healthy dishes and save the busiest of days. Rinse then soak the cashews in a bowl of hot water for 25 minutes. Drain and rinse again then transfer them to a powerful blender together with the garlic, the flesh of the avocado, lemon juice, dijon and the water (or aquafaba). Process until smooth and creamy. 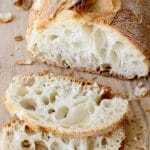 If the texture is grainy you’ll need to blend again but Do Not add more water. Season to taste with a pinch of sea salt and refrigerate until needed. Bring a medium pot of water to a boil then add a pinch of sea salt and the bay leaves. Stir in the beluga lentils and simmer on medium flame until tender, about 20 to 25 minutes. Drain the lentils in a mesh colander and immediately rinse them. Allow to drain well. Preheat your oven to 425”F. Cut the vegetables into small pieces and toss them with the balsamic vinegar, sea salt and black pepper to taste. 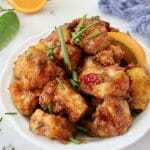 Place them on a parchment lined baking sheet without touching each other and roast for 35 to 40 minutes until tender. Alternatively you can air-fry them at 400”F for 20 minutes or pan sear in a cast iron skillet until tender. To serve spoon some of the aioli and spread it on the bottom of a salad plate. 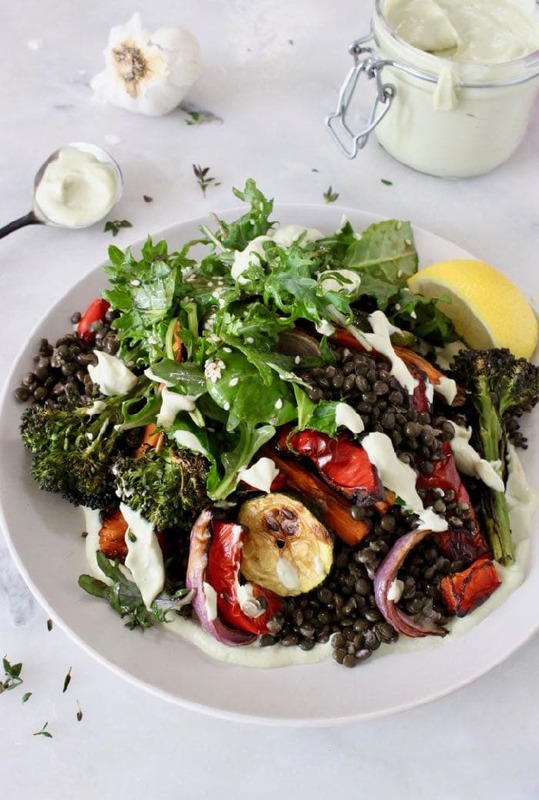 Top with the lentils and roasted vegetables and a handful of baby greens. Drizzle more aioli over the top and enjoy! 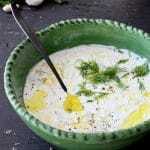 If you prefer your aioli sauce thinner simply add a little more lemon juice or water to thin it out to your liking. Remember to adjust seasonings to taste afterwards. When making the lentil salad you can toss baby greens in some balsamic vinegar if desired but not necessary since you are going to drizzle some more sauce over the top. 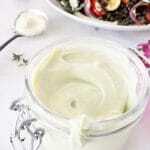 I’ve been experimenting with vegan Aioli for some time now with disappointing results and finally I hit the jackpot with this recipe. Absolutely sublime, the only thing I changed was adding 2 extra cloves of garlic but I’m sure that might be overpowering for some people so stick to the original recipe and add more garlic after you taste it. This is amazing, thank you for sharing and inspiring me to eat healthier at the same time.